Astigmatism is an imperfection in the curvature of your eye’s cornea. This hinders your eye’s ability to focus light onto your retina, resulting in blurred and distorted vision. Fortunately, astigmatism is minor and can be corrected easily through the use of toric contact lenses. Where a normal eye refracts light equally across all of the eye’s ‘meridians’ (imaginary lines across the surface of the eye), an eye with astigmatism means that light will be refracted more in one meridian than the other, distorting the light and the focal point it reaches. The image below depicts the differences between a normal eye and one with astigmatism. As illustrated, light beams aren’t refracted properly by the astigmatic cornea, resulting in distorted focal points in front of and/or behind the retina. This translates to blurred and hazy vision, which can also cause general discomfort. If not treated with toric contact lenses or glasses, astigmatism can result in headaches and eye strain. 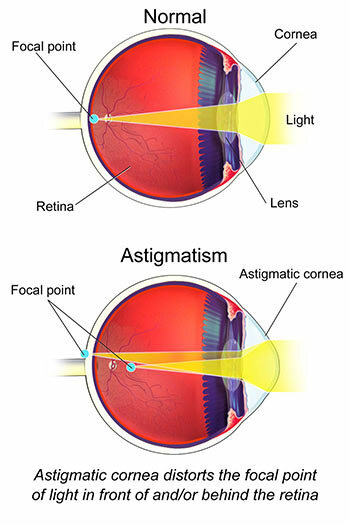 Astigmatism can be either regular or irregular. With regular astigmatism, the cornea of your eye is more curved in one particular direction than the other. 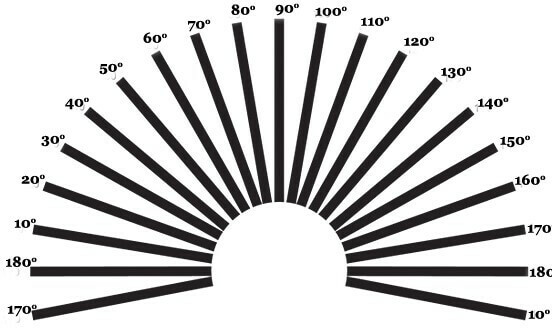 The principle meridians of your eye are 90 degrees apart, perpendicular to each other. Irregular astigmatism, however, is when the curvature isn’t an even curve across the surface of the eye. It can also be curved in multiple directions, or can be steeper towards the bottom. Myopic astigmatism – one or both of the eye’s principle meridians is shortsighted. Hyperopic astigmatism – one or both of the eye’s principle meridians is longsighted. Mixed astigmatism – one of the eye’s principle meridians is shortsighted, while the other is longsighted. So, what does vision with astigmatism look like? The two principle meridians of your eye, vertical and horizontal, can have differing effects on the type of vision you experience with astigmatism. When the vertical meridian is steeper, due to the effect of the astigmatism, your vision will be blurry when looking at vertical lines. This is called direct astigmatism. However, if your horizontal meridian is affected (known as indirect astigmatism), your eyes won’t be able to focus on horizontal lines, again resulting in blurred vision. The picture below depicts how viewers with severe astigmatism would see. Aside from blurred vision, astigmatism can have a number of other uncomfortable, and sometimes painful, symptoms. Some people may have astigmatism but not experience any of these symptoms. However, it’s important to get your eyes tested regularly to avoid causing unnecessary strain. And, if you experience any of these symptoms, it’s highly advisable to visit your optician or GP to see if astigmatism could be the cause. With the majority of cases of astigmatism, a person is born with an irregularly shaped cornea or lens, with the eye often resembling more of a rugby ball shape than the typical football shape. However, there have also been instances of astigmatism developing, or becoming more severe, later in life. The causes of such are unclear to scientists, however are believed to be related to genetic factors. If anyone in your family has astigmatism, then you’ll be much more likely to develop it later in life. Astigmatism is a common eye condition that is easily diagnosed by an eye doctor or optician. This test is done using different methods to evaluate how the eye focuses light. Firstly, your visual acuity will be measured, using a letter chart, to determine the clarity of your vision. Then, the focusing power of your eye will be measured with a series of lenses placed in front of them. The lenses that will provide your best vision will be your contact lens/glasses prescription. Finally, a Keratometer is used to measure the curvature of the cornea, while corneal topography can be used, if required, to provide an even more in-depth study of the surface of your eye. Before all this, however, you can perform your own astigmatism eye test at home with this helpful picture below. Sit at a distance of 3 meters from the computer screen and a look at the picture. First, cover your left eye with your hand and look at the picture with your right eye. Repeat with the right eye covered. If you see blurred lines, or there is a difference in sharpness between horizontal and vertical lines, you might have astigmatism, so please contact your optometrist or ophthalmologist for further examination. There are three options to correct astigmatism – refractive surgery, corrective eyewear and toric contact lenses. Besides from refractive surgery, which can be very expensive, toric contact lenses are often the most convenient and effective option for correcting astigmatism. They differ from normal contact lenses in that instead of being spherical, they are actually a torus shape – more similar to a slice of a ring donut shape than a slice of a football shape. This allows them to bend and adjust to help your eyes focus on light effectively, therefore offering clearer and undistorted vision. 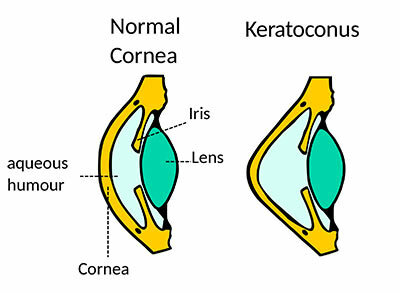 Another difference between toric contact lenses and regular lenses is that torics contain different powers at different meridians (invisible lines across the diameter) to correct the varying degrees of myopia (short-sightedness) and/or hyperopia (long-sightedness). In most cases, other contact lenses contain one power all the way through the lens. In addition, toric contacts have a design that enables them to rotate into position so that the meridians of power are lined up with the meridians of your eyes that are in need of visual correction. Toric contact lenses are typically soft contact lenses, however toric editions of rigid gas permeable lenses can be used for correcting irregular astigmatism only. There are also a wide range of toric lenses on the market, meaning that you can find lenses for your wearing needs, whether you’re after daily disposables, two weekly contacts, monthly lenses and soon, coloured contact lenses. Unfortunately, you won’t be able to change the shape of your eye to get rid of your astigmatism. However, there are some simple exercises you can do to help train your eyes to see better and adapt to your toric contact lenses to the best of your ability. 1. Read without your glasses or contacts for a short period of time, then gaze at some other object, then read again, until your eye gets tired. Do this every day, and after a while, you’ll find that you can continually read for a longer period of time. But don’t strain yourself! 2. Probably because of the already mentioned meridians, people with astigmatism tent to tilt their heads on one side. Try to see if you’re doing it, and try tilting your head to the opposite side. 3. This exercise is for relaxing your muscles. Again, without your corrective lenses, put your finger 10cm in front of your nose and just look at it while relaxing your eyes. Then move your finger up to the 12 o’clock position and look at it for a while. Then return the finger to the first position, relax, then move to 3, 6 and 9 o’clock positions. 4. Eye massage – put your fingers on your closed eyelids and lightly massage your eyeballs, applying just enough pressure not to cause any pain. 5. 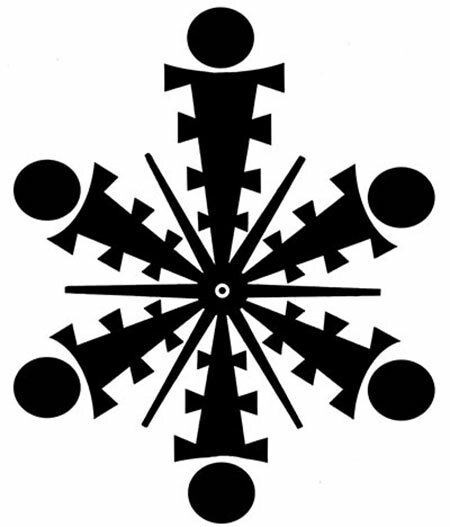 This one is called the Tibetan eye chart. Look at the picture below at about 2.5cm away, and as you inhale, try to slowly move your eyes over the steps until you see the ball. You may not see the chart clearly, but it doesn’t matter, the point is in exercising you eye muscles. Try and follow all the steps in clockwise, and then in counterclockwise direction. Does astigmatism get worse over time? While it’s not always the case, the severity of astigmatism can increase as you age. In fact, it’s quite common for direct astigmatism to develop into indirect astigmatism later in life. As our eyelids loosening as we age, the pressure that the eyelids usually place on the cornea actually subsides, resulting in a decrease in the steepness of the vertical meridian curve. In turn, the severity of the horizontal meridian curve is increased, resulting in a switch from direct to indirect astigmatism, which can worsen at a gradual rate itself. Unfortunately, astigmatism cannot simply disappear. Sometimes direct astigmatism can lessen in severity, however can often go the other way and result in indirect astigmatism. However, as stated above, you can correct your astigmatism with toric contact lenses, or can look for a permanent solution with refractive eye surgery. It’s actually possible to have a mild case of astigmatism and not know about it due to the effect on your vision being minimal at most, however this can lead to headaches, low night vision, eye pain and possibly some blurred vision further down the line. So, if you frequently experience any of these symptoms, please pay a visit to your eye doctor or go for an eye exam.